Now there is a new TSS (Travellers Service Site) on this blog, where you can check out how to ship your vehicle. This post is a copy of the second part. You can get to the site with all information HERE. 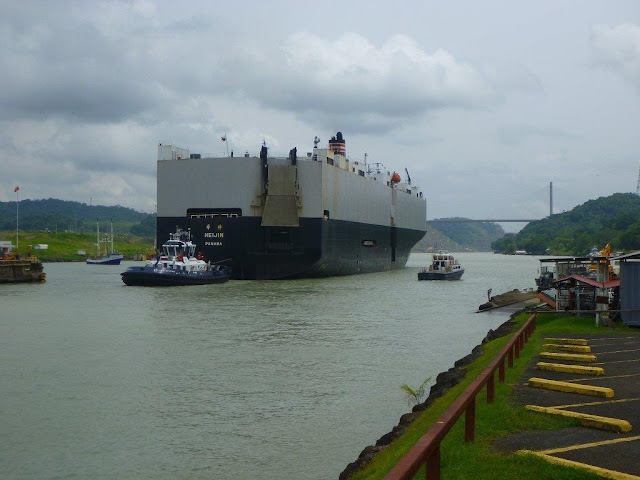 Shipping Company: RoRo you can ship with Wallenius Wilhelmsen, click the link to get directly to their webpage with ship schedules, on-line shipping-quote request etc. 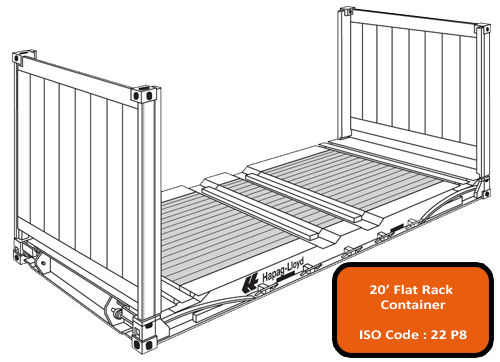 If you decide to ship in a container you might inquire i.e. at Seaboard Marine, click the link for a quote on-line. Agent: Beristain & Asociados, S.C.
Victor is great, he is fluent in English, Spanish and German. I walked to their office which is right in the centro viejo. I was most of the time picked up or dropped off by Victor or one of Beristain's employees at the hotel. I was nowhere sent on my own, even to the Bancercito they were coming with me and even helped me get my cash deposit back right there. Which is uncommen, usually you can not apply for the refund until your vehicle has physically left the country = ship rolled out of the harbour. 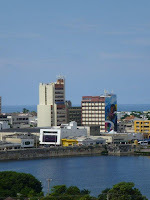 Where to stay in Veracruz: I stayed at Gran Hotel Diligencias for a great special through bookinig.com. I paid a little short of USD 50/night but you are right at the square in town. Rooms are big, I got a corner room with a view to the square and to the pool. Regular prices are about three times more. So you will have to check for specials at the time you are searching. You save on taxis vs. staying further out for less, since you can walk anywhere. Or you might enjoy Victor's pick-up service. Free Internet. Free parking, hight limitations is about 2.60 meters. If your vehicle is higher, check out the Holiday Inn with secure parking in the courtyard for vehicles close to 3 meters tall. Or Hotel Hawaii (yes that is really the name) I walked by there and it looked like you should be o.k. at their parking for any kind of hight your RV or expedition truck might have. Unlike in other towns I have not seen a lot of secure parking options just close by in old town. This is a small family business. Luis and his wife and son are just super, super nice and are doing a great job in helping you and communicating very fast respondingly with you. The office is a little difficult to find. 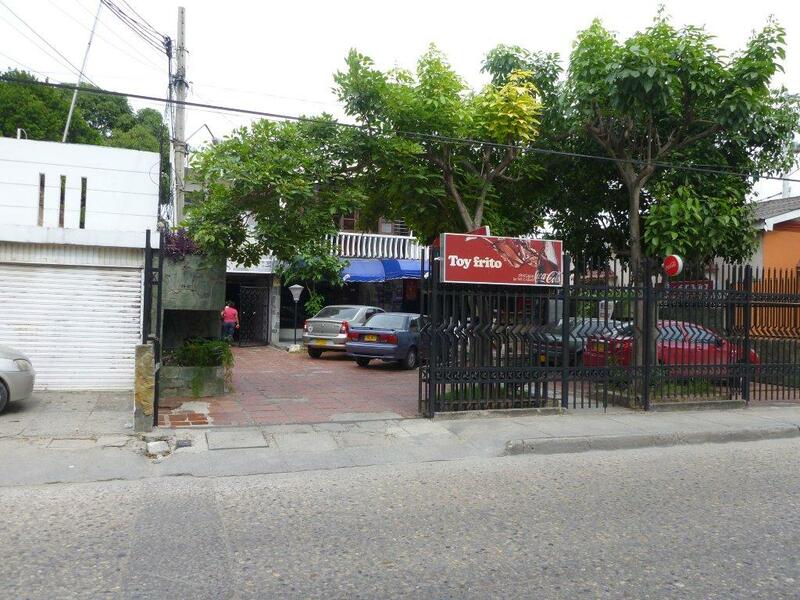 Here is a picture what the entrance looks like, since there is no specific sign of their office and the office No. 103 is kind of in the back. Other things you will need for Cartagena: You need to get a notary to verify your personality matching with your passport. Enlace will do that with you and drive you there. You will also need prove of personal injury and accident insurance for yourself in order to enter the harbour. If you can not provide that it is possible to buy one-day insurance coverage with the harbour. Enlace will help. Current pricing for the one-day thing was USD 23/day/person. Car insurance is mandatory in Colombia, Enlace will help you getting it at an insurance agency close by. Note: Even the agent say that the process is not standardized and sometimes customs might ask for something they have never asked before. Where to stay in Cartagena: Once you have your vehicle you can camp at the Hotel Bellavista. It is not a nice area to camp neither a nice Hotel to stay but it is convenient to get your car set up again prior to start off exploring Colombia. The entrance to the parking/camping area is suitable even for large trucks. 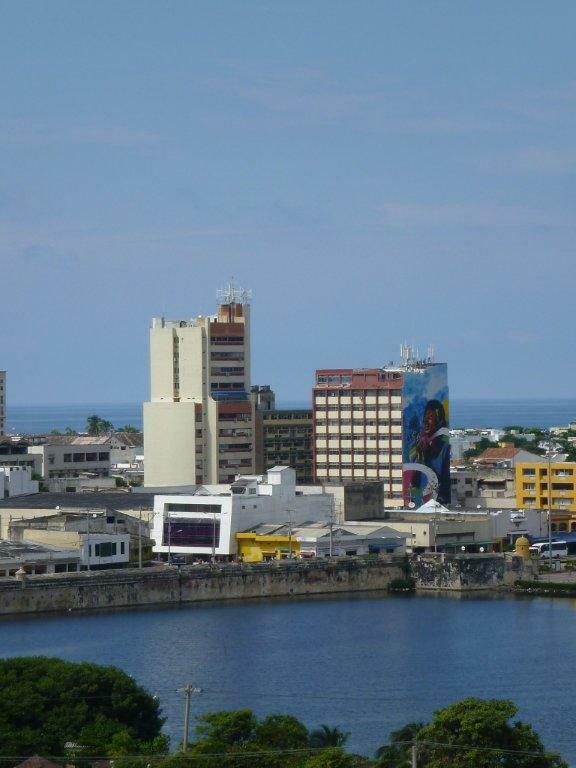 Before I had my car I was staying at Hotel Stil in Cartagena, the building is not attractive but the rooms are big with A/C and with a nice view if you are at one of the higher floors of the 10 floors. It is clean, has free Internet that works most of the time. The cleaning and maintenance staff on my floor was super nice and friendly. It is safe and right at the edge to the fantasticly beautiful old town. 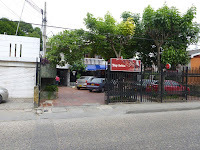 You have shops and two Exito supermarkets (kind of Colombia's Walmart) within a couple of minutes walking distance. I was lucky and got a room towards the old town and the sea. You might want to ask for that. I booked it through booking.com and paid about USD 48/night. I was told at the front desk, that prices vary significantly depending on the season, weekends are more expensive than weekdays. Breakfast is included. The building with the big graffiti on the wall is Hotel Stil. The Hotel does not have a secure parking area but I had asked for the only night I had the car, whether I could park my car right in front of the hotel at the little dead end street where the taxis use to stop. They allowed me to do so but only over night not during the day. I also "hired" a homeless guy to watch over my car for that night, he did and slept right on the bench next to my truck. I paid him COL 2'000 in the evening and promised him another COL 3'000 in the morning if he was still there and the car was fine, that worked out good. Potential Risks: I have heard that the risk that your car on the RoRo trip might get broken in is high. I had put significant effort in locking the drivers cabin from the back of the car where all my things are and it has proven worthwile. 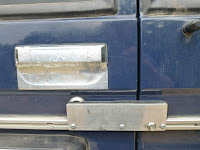 I also blocked the access to the rear door lock since it is the same key as the cars ignition and of course the key remains in the car. You will not drive the car onto and off the vessel yourself. My truck is high clearance and there were no problems or damages at all. But I have heard that about a third of mortorhomes that sit low and have a large overhang behind the rear axle had suffered damage. Depending on the harbour and the load of the RoRo vessel the angle to drive in and out can be steep which might result in some damage. You can not insure any of your goods inside the car. 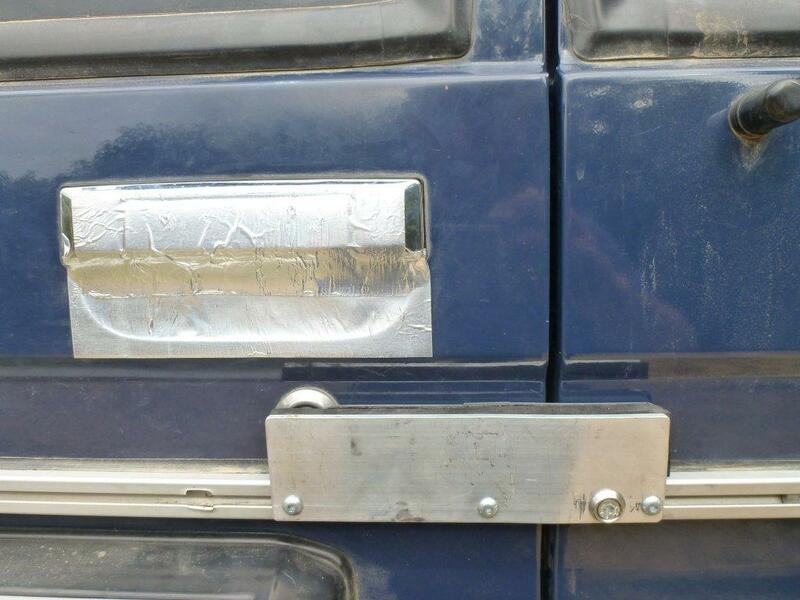 If you can not lock your equipment and make it safe I would recommend to ship by container, if too tall a high cube or a flat rack container might still limit the risk of a break-in significantly. See above for Seaboard Marine information. 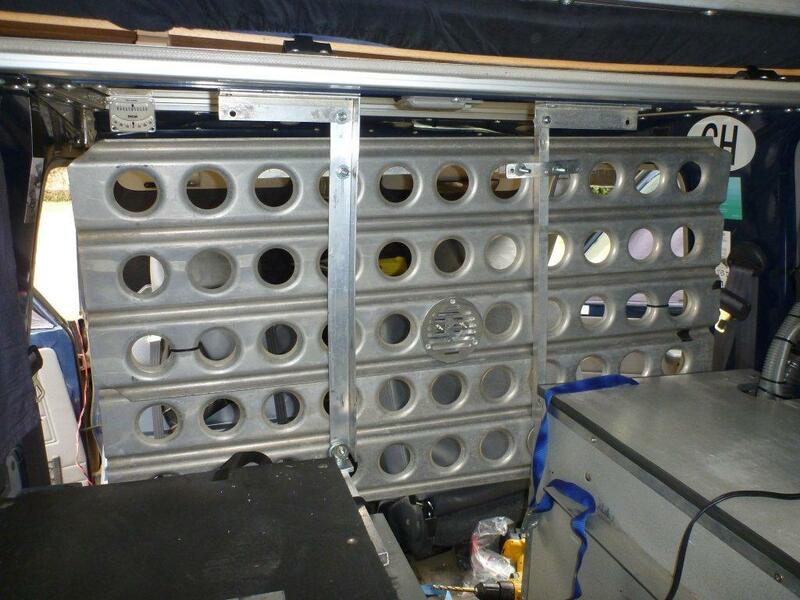 The blog post well explains the things to keep in mind while shipping a car. A very helpful post indeed. Möchtest Du meinen deutschen blog lesen? Would you like to to read my german blog?